Kidney failure refers to temporary or permanent damage to the kidneys that results in loss of normal kidney function. There are two types of kidney failure—acute or chronic. Acute kidney failure has an abrupt onset and is potentially reversible. Chronic kidney failure progresses slowly over at least three months and can lead to permanent kidney failure. The causes, symptoms, treatments, and outcomes of acute and chronic kidney failure are different. In the general population, slightly more than 30 people in every 100,000 develop kidney failure each year. In children and adolescents aged 19 and under-the annual rate is only 1 or 2 new cases in every 100,000 children. In other words, adults are about 20 times more likely to develop kidney failure than children. The risk increases steadily with age. Moreover, boys are nearly twice as likely as girls to develop kidney failure from birth defects, polycystic kidney disease, or other hereditary diseases. What are the causes of kidney failure in children? Kidney failure may be acute or chronic. Acute diseases develop quickly and can be very serious. Although an acute disease may have serious consequences, it usually lasts for only a short time and then goes away once the underlying cause has been treated. Unfortunately certain types of acute kidney failure may progress to chronic kidney failure particularly if treatment is delayed. Chronic kidney diseases, however, do not go away and tend to get worse over time. When the kidneys stop working, doctors use a treatment called dialysis to remove waste products and extra water from patients with chronic kidney failure. Decreased blood flow and oxygen to the kidneys for a period of time. This may occur from blood loss from accidents or during surgery, or shock from any cause. Glomerulonephritis in which the glomeruli – the filtering unit of the kidney – become inflamed and impair the kidney’s ability to filter urine. Unfortunately, the conditions that lead to chronic kidney failure in children cannot be easily fixed. Often, the condition will develop so slowly that it goes unnoticed until the kidneys have been permanently damaged. Treatment may slow down the progression of some diseases, but in many cases the child will eventually need dialysis or transplantation. Birth defects. Some babies are born without kidneys or with abnormally formed kidneys. The kidney abnormality is sometimes part of a syndrome that affects many parts of the body. Blocked urine flow and reflux. If blockage develops between the kidneys and the opening where urine leaves the body, the urine can back up and damage the kidney. Hereditary diseases. In polycystic kidney disease (PKD), children inherit defective genes that cause the kidneys to develop many cysts, sacs of fluid that replace healthy tissue and keep the kidneys from doing their job. In Alport syndrome, the defective gene that causes kidney disease may also cause hearing or vision loss. Glomerular diseases. Some diseases attack the individual filtering units in the kidney. When damaged, these filters-which are called glomeruli-leak blood and protein into the urine. If the damage to the glomeruli is severe, kidney failure may develop. Systemic diseases. 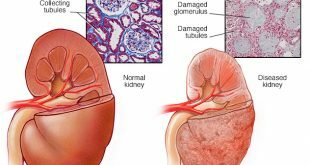 Diabetes and lupus can affect many parts of the body, including the kidneys in some people. In lupus, the immune system becomes overactive and attacks the body’s own tissues. Diabetes leads to high levels of blood glucose that damage the glomeruli. Diabetes is the leading cause of kidney failure in adults. In children, however, diabetes is low on the list of causes because it usually takes many years of high blood glucose for the kidney disease of diabetes to develop. However, an increasing number of children have type 2 diabetes, which is usually associated with adults. As a result, we may see more children with chronic kidney failure caused by diabetes in the future. From birth to age 4 years, birth defects and hereditary diseases are by far the leading causes of chronic kidney failure. Between ages 5 and 14 years, hereditary diseases continue to be the most common causes, followed closely by glomerular diseases. In the 15- to 19-year-old glomerular diseases and systemic diseases are predominant. Treatment of Acute Kidney Failure depends on the underlying cause. In some cases, children may develop severe electrolyte disturbances and toxic levels of certain waste products normally eliminated by the kidneys. Acute kidney failure also may lead to too much fluid in the body. Dialysis may be indicated in these cases. Treatment of Chronic Kidney Failure depends on the degree of kidney function that remains. Most children with kidney failure are followed by a pediatrician and a nephrologist (a doctor who specializes in disorders or diseases of the kidneys).